These Pumpkin Cheesecake Streusel Bars feature a gingersnap cookie crust, a creamy pumpkin cheesecake filling, and are topped with a delicious streusel topping! Taste: Full of pumpkin flavor! Texture: The cheesecake filling is super smooth and creamy. Ease: A little time consuming, but not too difficult to make. Appearance: The streusel topping makes these bars so gorgeous! Pros: Absolutely delicious and perfect for pumpkin lovers! Cons: They do take some time to make and chill, but they’re definitely worth it. If there’s one thing I love more than the cooler weather that comes along with fall, it’s all of the pumpkin recipes. 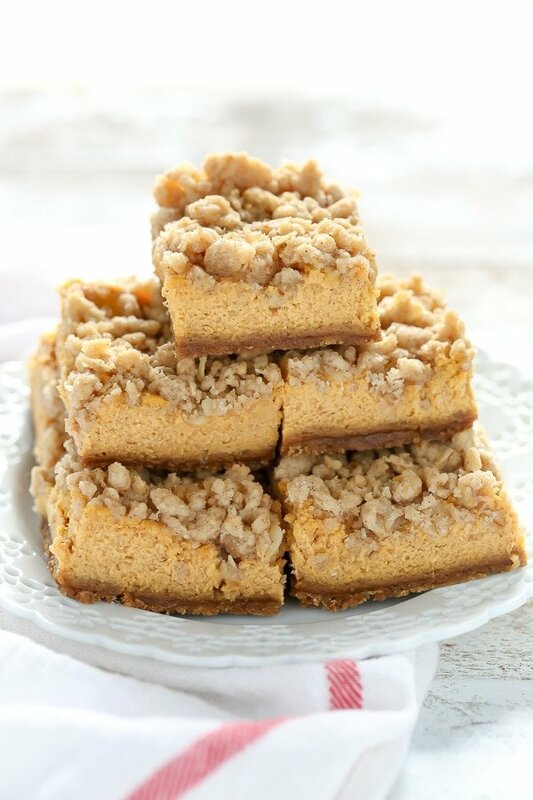 If you’re anything like me and love pumpkin too, then these Pumpkin Cheesecake Streusel Bars are exactly what you need! Between the crust, creamy pumpkin filling, and streusel topping these cheesecake bars are almost impossible to resist. The base of these cheesecake bars starts with a gingersnap cookie crust. When it comes to pumpkin cheesecake, a gingersnap crust pairs so perfectly with it! If you’re not a fan of gingersnaps or don’t have any on hand, you could do a graham cracker crust instead. The graham cracker crust in this recipe is my favorite, which is just as easy and delicious! And that pumpkin cheesecake filling? I’m pretty sure this cheesecake filling may be the creamiest cheesecake filling I’ve ever made. All of the delicious pumpkin and spices in it too definitely doesn’t hurt either. Just a quick tip to get that creamy cheesecake filling, make sure to set your cream cheese and eggs out ahead of time so they can come to room temperature. The room temperature ingredients will incorporate together so much easier and give you a perfectly creamy filling. One last touch I wanted to add to these bars was a streusel topping. Not only is the topping super easy to throw together, but it adds a little something extra to these bars that takes them over the top! If you really want to go all out, you could top the bars off with a little homemade salted caramel sauce too. These bars are seriously so good and perfect for pumpkin lovers. 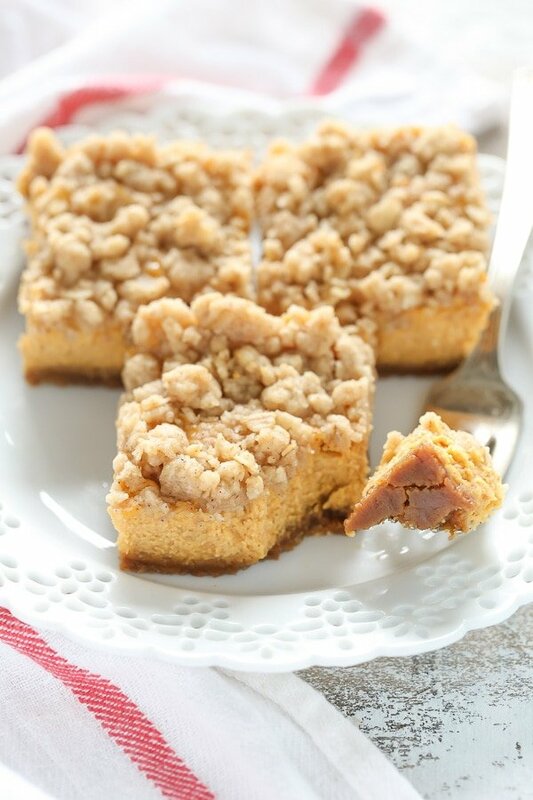 Even if you’re not a pumpkin lover, I think you may change your mind after just one bite of these Pumpkin Cheesecake Streusel Bars! Preheat oven to 325°F. Line an 8-inch square baking pan with aluminum foil, making sure to leave some overhang for easy removal, and set aside. Combine the gingersnap crumbs, melted butter, and granulated sugar in a medium sized mixing bowl and mix until fully combined. Scoop the mixture into the prepared baking pan and firmly press it down into one even layer. Bake at 325°F for 10 minutes, remove from the oven, and set aside to cool. Keep oven temperature at 325°F to bake the cheesecake. In the bowl of a stand-mixer fitted with the paddle attachment, or in a large mixing bowl using a hand-held mixer, beat the cream cheese until smooth. Add in the sugar, pumpkin puree, vanilla extract, and pumpkin pie spice and mix until fully combined. Add in the eggs, one at a time, and mix on low speed until just combined. Pour the cheesecake filling on top of the crust and spread it out into one even layer. Add the flour, brown sugar, oats, cinnamon, and salt to a medium sized mixing bowl until well combined. Add in the cubed butter and cut it into the mixture using a pastry cutter or fork until you have coarse crumbs. Evenly spread the topping on top of the cheesecake filling. Return the cheesecake back to the oven and bake at 325°F for about 35 minutes or until the top of the cheesecake is set. Remove the cheesecake from the oven and transfer to a wire rack to cool for at least one hour, then cover and transfer to the refrigerator for 2-3 hours or until completely chilled. Remove the bars from the pan, slice into bars, and enjoy! 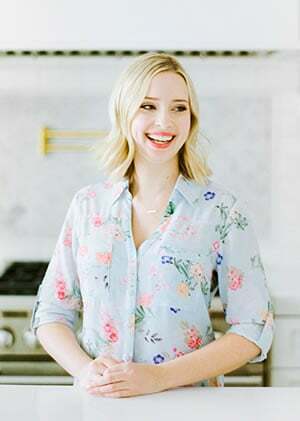 Danielle is a self-taught baker and the blogger behind Live Well, Bake Often. She loves spending time in the kitchen creating new recipes to share with her readers as well as sharing tips to help them along the way. When she's not in the kitchen baking, she's usually spending time with her husband and three dogs.